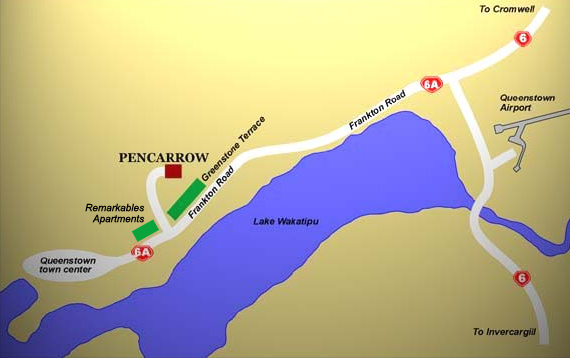 Pencarrow is located on 4 acres at 678 Frankton Road (SH 6A), the main road to Queenstown. 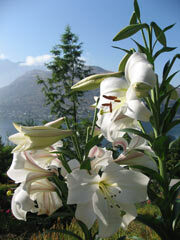 It is 3.5 kilometers from Queenstown airport and 4 kilometers from town center. From the airport follow signs to Queenstown SH 6A (Frankton Road). From Cromwell take SH 6 until it becomes Frankton Road. From Invercargill take SH 6 and turn left onto Frankton Road. To reach Pencarrow, at Frankton travel towards Queenstown on 6A (Frankton Road). You will pass a Z petrol station on your right. Travel 1.2 kilometers past the Z station and turn right into the dark(gray) apartments (Beechwood). The Remarkables Apartments will be on your left as well after turning. Instead of turning right again into the beechwood Apartments or left into Remarkables Apartments parking areas, travel straight up till you see road sign "Pencarrow Lane" point to us. Please call if you have any difficulties 0210345888. .